Few days ago we presented the bēm wireless Mobile Speaker , a tiny 6″ cubed bluetooth speaker you can bring everywhere you want. 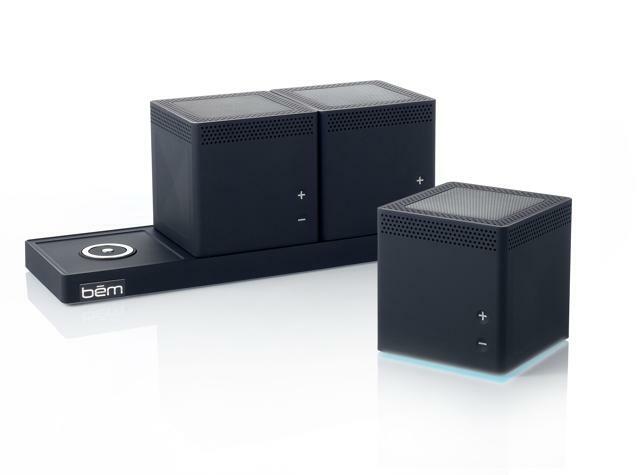 Bem has also released the Speaker Trio made of three speakers sharing a wireless connection to the 18” Speaker Trio base for a neat, easy recharge—but not until after you place them up to 120 ft. apart to enjoy your tunes in multiple rooms (all controlled by one Bluetooth® device). At your next party, try one in the living room, one in the kitchen and one on the patio. No more wires or plug-in charging–just return the speakers to the base for a neat and easy recharge. These three speakers share a wireless connection to the base, but each one can be placed in a different area up to 115 feet apart (depending on room conditions), all controlled by the same iPhone®, iPad®, smartphone or other Bluetooth® device. Available here in black or white.